Greek: Myotis - "mouse ear." Latin: sodalis - "companion." Fur: Dull grayish brown above, lighter below; hair basal two-thirds brownish-black, narrow grayish subterminal band, brownish tip. Tail membrane: Dark brown, sparsely haired near base. Wing membrane: Dark brown, sparsely haired. Ears: Short «16 mm), do not extend 2 mm beyond nostrils when laid forward; blackish, naked, blunt tip. Tragus: About one-ear length; blunt tip; not obviously curved. Other: Hairs on toes sparse and not extending beyond claws. Total length: 70-97 mm. Forearm: 35-41 mm. Wingspan: 240-267 mm. Total weight: 5-8 g.
Tooth number and formula: 38 total; I 2/3, C 1/1, P 3/ 3, M 3/3. Little brown myotis (M. lucifugus): Fur glossy brown; calcar rarely keeled, toe hairs longer than claws. Northern myotis (M. septentionalis): Ears extend more than 2 mm beyond nostrils when laid forward; tragus more than one-half ear length and pointed. Eastern pipistrelle (P. subflavus): Fur yellowish; dark wing membrane contrasting reddish forearm. Overall: Primary population centers in Missouri, Indiana and Kentucky; range includes Oklahoma, Iowa, Wisconsin east to Vermont and south to northwest Florida. Iowa: Southeastern one-third north to Jasper, Madison, Marion and Dubuque Counties (see map below) . Although all bats in Iowa are protected (Iowa Code 109.42), the Indiana Bat is the only federally endangered mammal in the state. The principal reason for this status is the potential for loss of a significant portion of the population with destruction of any of the few remaining over-wintering sites. Most of these bats hibernate in very large clusters of about 100,000, chiefly in a few caves and mines in Missouri, Indiana and Kentucky. The remainder are scattered throughout the southern part of the winter range with a few as far north as Dubuque County. In summer, 50 or more females establish nursery colonies, chiefly under bark of dead or dying trees along streams or upland forests. 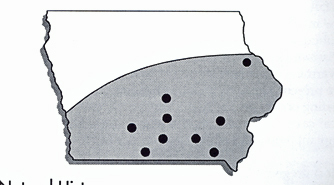 In Iowa, sites with nursery colonies evidenced by pregnant or lactating females have been located in south-central counties of Appanoose, Decatur, Jasper, Louisa, Lucas, Madison, Marion, Monroe, Van Buren and Wapello. Single young are born from late June to early July, with the earliest born flying by the first week of July. 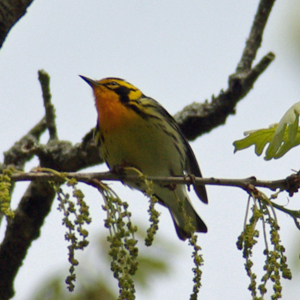 Recent studies in Illinois, Missouri and Michigan, suggest that several roost trees may be used during the summer, probably reflecting both seasonal microhabitat temperature changes and dispersal from nurseries (Callahan 1993). Recent concern has focused on loss of summer habitat because winter data show a continual decline despite the protection of major hibernacula. 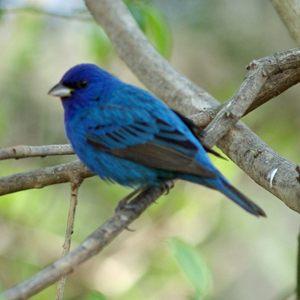 Females forage for insects in summer chiefly around the crowns of trees in forest openings and along forest edges near the nursery. Like most insectivorous bats, the Indiana myotis feeds on a variety of small insects. Some studies suggest a shift by pregnant females from eating soft-bodied insects (flies, moths and stone-flies) to consuming those with harder bodies (beetles) later in the season. In fall, most Indiana myotis migrate southward, but a few males and females hibernate in mines and caves in Dubuque County and presumably elsewhere along the Mississippi River. Although not reported in Iowa, fall swarming of the species occurs when at least some males are present. 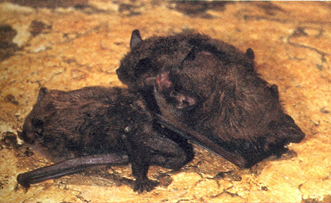 As with the other northern myotine bats, mating occurs primarily during the fall, probably in or near caves. However, details of ovulation, fertilization, implantation and early pregnancy are poorly known. Most pregnant females leave their hibernacula by late April and migrate northward. A pregnant female captured in Marion County on 29 June 1979, for example, had been banded that spring at Pilot Knob Mine, Iron County, Missouri (ca. 278 mile distance). Most females in Iowa are believed to overwinter in central Missouri. On the other hand, most males remain in the vicinity of the hibernacula throughout most or all of the year; only three adult males have been reported from Iowa.